With Apple stock is hitting all-time highs, is there still upside for investors hoping to get meaningful income from the tech giant? Apple (NASDAQ:AAPL) stock has crushed the S&P 500 this year, serving up a 31% return for investors. The S&P 500 is up just 6% during the same period. And thanks to a better than expected fiscal Q4, Apple stock is now hitting all-time highs. While the gain in Apple stock is great for shareholders, has its rise eliminated any potential for meaningful gains from here? A closer look reveals that there are still solid prospects for investors in Apple stock -- especially those who value dividends. In an effort to make better use of its growing cash hoard, Apple initiated a dividend in 2012. Already a cash cow industry leader, the new dividend instantly qualified Apple as one of the market's best dividend stocks. And this opportunity became even more lucrative when shares fell to the post-split equivalent of $60 about a year and a half ago. While we may no longer be able to call Apple "a dividend investor's dream stock," given the roaring gain in the share price recently, there is still value in Apple stock's dividend potential. 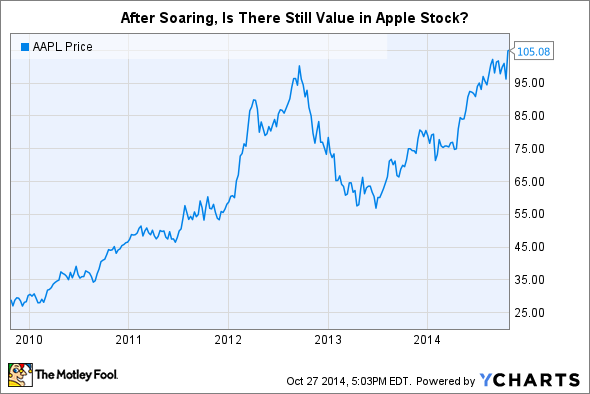 "But Apple stock's dividend yield is only 1.8%," some income investors may protest. "How will that produce any meaningful income?" This is a valid concern. After all, other dividend stock veterans, like Microsoft and IBM, have much juicier dividend payouts. Microsoft and IBM both have dividend yields of 2.7% -- considerably higher than Apple's. But Apple makes up for its small yield in other areas. First and foremost, a good dividend stock should have the qualities of an enduring investment. What makes Apple's position as a market leader sustainable for the long haul is its incredibly powerful ecosystem of integrated hardware, software, and services. Combined with its powerful brand, this ecosystem often turns an iPhone sale into Mac and iPad sales. And the well-integrated ecosystem of high quality products leads to high customer satisfaction and, most importantly, repeat purchases. Best of all, this "sticky" ecosystem is showing no signs of deterioration. In fact, it's looking stronger than ever. iPhone 6. Apple considers its iPhone as one of its "gateway products" that introduces new customers to its ecosystem and eventually leads them to buy other Apple products. Image source: Apple. Then there's Apple's heady cash flow. With free cash flow at 27% of Apple's sales, Apple's cash flow is no joke. Apple's strong free cash flow is enabled by pricing power, economies of scale, and excellent stewardship. Free cash flow is the good stuff left over after operating expenses and capital expenditures. It's the cash that management can use to create more shareholder value by saving it for future capital expenditures, acquiring other companies, paying out dividends, or repurchasing shares. High levels of free cash flow make a dividend more viable and also increase the likelihood of dividend growth in the future. 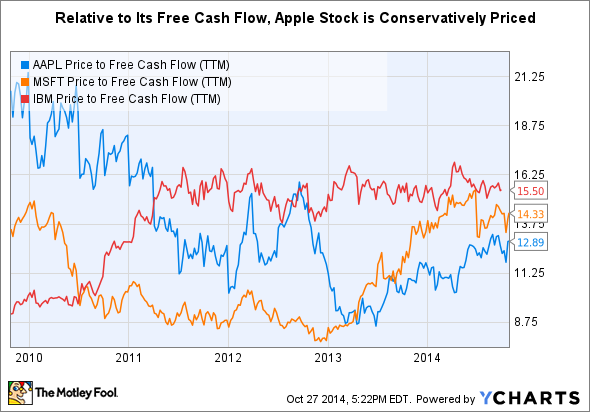 The price-to-free cash flow valuation metric shows that, on a per share basis, Apple's free cash flow is strong. Like the well-known P/E ratio, the lower this metric, the cheaper the stock. Though Apple's P/FCF metric is up considerably in the past year, it still sits meaningfully lower than tech peers Microsoft and IBM. Finally, consider Apple's top-notch stewardship. Not only is the company now planning to increase its dividend on an annual basis, but it is also aggressively using cash to repurchase shares. Apple has spent a whopping $45 billion on repurchases in the last year alone. Even better, these shares were bought at prices that trade at a discount to today's share price. Then there's Apple's penny-pinching approach to acquisitions, a strategy that has kept Apple focused on its core business while also reducing the possibility of wasting shareholder money on speculative bets. This sort of stewardship provides evidence for investors that Apple will consistently make shareholder friendly decisions with its cash -- an especially important characteristic to look for in an investment for income investors. Overall, even at $105 per share, Apple is a great long-term bet for investors looking for income.